Motivated by a vision of a digital society with billions of devices communicating over cellular radio access technologies, 3GPP - in Release 13 - developed no less than three new technologies for the support of internet of things; Extended Coverage GSM Internet of Things (EC-GSM-IoT), LTE for Machine-Type Communications (LTE-M) and Narrowband Internet of Things (NB-IoT). Each has been standardized to ensure that increasingly diverse device and application types are supported by 3GPP networks, around the world. EC-GSM-IoT is building on GPRS/EGPRS and its success as one of the most popular cellular technologies for machine-type communications (MTC). Already GPRS/EGPRS is competitive in the MTC market through its low device cost and global presence which can be attributed to the four GSM frequency bands 850, 900, 1800 and 1900 MHz which support roaming across most parts of the world. To these qualities EC-GSM-IoT adds improved coverage by 20 dB over EGPRS, LTE-grade security, power efficient operation and even further reduced device complexity beyond what EGPRS can offer. The main components of LTE-M, which is the abbreviation commonly used for the LTE improvements for MTC, are a series of low-cost device categories (e.g. Cat-M1 and Cat-M2) and two coverage enhancement modes (i.e. CE modes A and B). 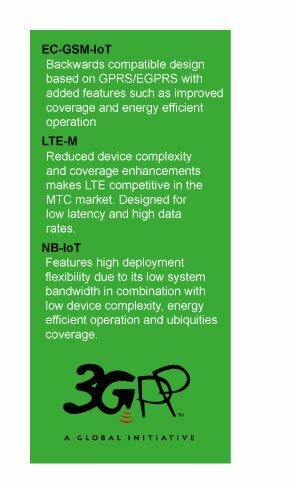 LTE-M was originally designed to reduce the device complexity to make LTE competitive with EGPRS in the MTC market. In addition to its low complexity, it does support secure communication, ubiquitous coverage, and high system capacity. LTE-M’s ability to operate as a full-duplex system over a larger bandwidth also gives it an additional dimension with its capability to offer services of lower latency and higher throughput than EC-GSM-IoT and NB-IoT, qualities which allow LTE-M to support services such as voice over IP. LTE-M supports both full-duplex frequency division duplex (FDD), half-duplex FDD, and time division duplex (TDD). While EC-GSM-IoT and LTE are based on existing radio access technologies, NB-IoT is to a large extent a new radio access technology. It can operate over a system bandwidth as low as 200 kHz, in stand-alone mode, within an LTE carrier, or, within the guard-band of an LTE carrier. It also supports a minimum channel bandwidth of only 3.75 kHz. This gives an unmatched spectrum flexibility and system capacity which in combination with qualities such as energy efficient operation, ultra-low device complexity and ubiquities coverage makes NB-IoT a very competitive technology in the IoT market. 3GPP now offers three new radio access technologies for long-range, power efficient, massive machine-type communications. Compared to proprietary competitors in the low power wide area segment the value of 3GPP standardized solutions are high. Differentiating factors include that the 3GPP technologies build upon an existing global eco-system supporting the option to install the cellular IoT solutions in networks deployed all over the world. The operation in licensed spectrum also allows for a level of control and quality assurance, not possible to achieve by proprietary technologies operating in the unlicensed frequency domain. 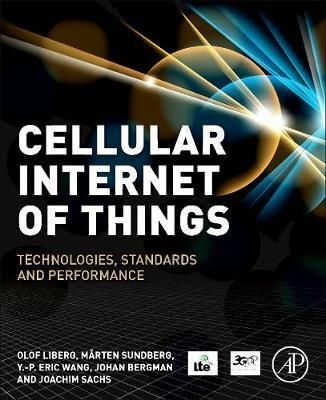 Further information about EC-GSM-IoT, LTE-M and NB-IoT can be found in the recently published book ‘Cellular Internet of Things: Technologies, Standards and Performance’. It sets out to introduce, characterize and, when relevant, describe in detail these three new technologies that define the Cellular Internet of Things.